The thing about snowplows is that they have good intentions. They're meant to be convenient. They provide a worthy service for those needing to travel without slip-sliding on white gunk. But although they clear the snow from one location, they move it to another. Sometimes, that's just fine. Other times, it creates even more problems. 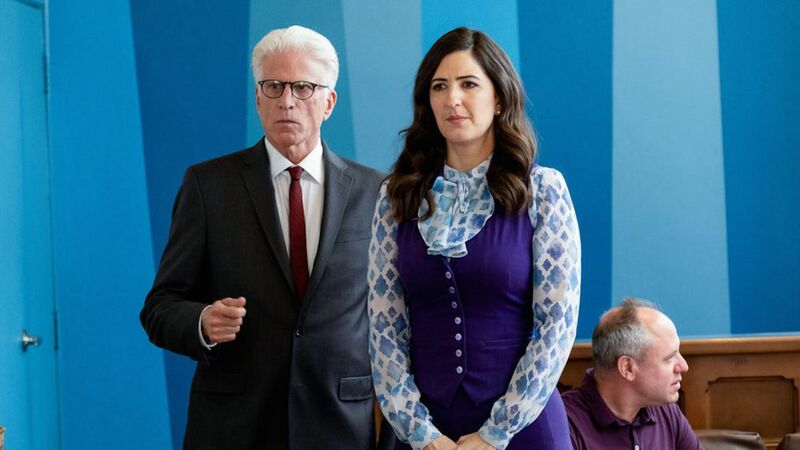 It's fitting, then, that Michael uses a snowplow as a simile for how he's "helping" his four favorite humans throughout "The Snowplow," the third episode in The Good Place's Earth-bound third season. While the eternal being's intentions are always good, his continued meddling causes a real snowball effect. And months later, all his attempts to make things right cause a blizzard of bad luck; one that even a snowplow couldn't clear. Michael and Janet arrive on Earth, exhilarated from breaking the rules. They disregard the Judge’s anger and set up shop one floor above the humans at the college, where they monitor their gatherings. From that vantage point, they learn Eleanor’s running out of money; she tells Chidi she needs to get a part-time job, which Michael knows will mean her missing class. Though they’re all but human now, Janet still has some advantages — and one of those advantages is knowledge of all the winning lottery tickets printed before they arrived. She and Michael pick the winning card, but Janet has some misgivings about the venture. In a stroke of incredible luck, Eleanor ends up winning $18,000 in the lottery. For a few months, all goes well… until Tahani admits that she plans on sleeping with Jason when they watch the Jaguars game together one night. Michael won’t stand for it, so he and Janet go snowplowing once more. With Janet overseeing the plan, they set Tahani up with her old boyfriend, Larry Hemsworth. They solve the problem of her standing Jason up by sending him to the Australian chapter of the Jacksonville Jaguars fan club, from which he happily emerges in full teal body paint with cheetah prints and an afro wig in Jags colors. Six more months pass, and the human gang reminisce about how much their lives have improved over the past year. Tahani makes a big announcement: Larry has proposed to her, and she’s moving back to London to plan their wedding. She tells the team she’s planned a little going-away party, and invites them to the event. It becomes apparent that the duo of eternal beings have continued messing with their friends’ lives. All of that, Michael says, needs to stop. They have to focus on keeping Tahani in Australia, he claims, so that the group doesn’t break up and go back to their old ways. When the gang walk in the door, it’s clear that “come as you are” has a very different meaning to Tahani than it does to them. It’s a glamorous endeavor in a mansion-like setting, found not on Airbnb, but Heirbnb (where heiresses go to swap private islands, mansions and blimp hangars, according to Tahani). They meet Larry, but Jason manages to hit the man right where it hurts when he asks a question about his brother, Liam. He storms off, and Tahani follows him. Meanwhile, Michael and Janet — dressed as caterers — prepare to put their plan into action. They attempt to convince Larry to stay in Australia, but fail spectacularly when he realizes they’re not really there to serve hors d’oeuvres and assumes they’re tabloid writers. Things get even worse: when Eleanor suggests that they need a new group member to replace Tahani, Simone and Chidi say the experiment has reached an ending point. This is the worst scenario possible for Janet and Michael, who scrap their old plan and go off to deal with Jason and Eleanor, respectively. Michael tries to convince Eleanor to tell the others how much the study means to her, and she seems inspired by his suggestion. Later, when they’re giving speeches, she does just that — and again, Michael’s plan falls flat because things don't go Eleanor's way. She throws a tantrum truly worthy of the Bad Place as she ruins Tahani’s cake and storms out. Simone catches Eleanor hiding behind a tree, and calls her out on her behavior. They talk, and Simone explains that there might be an evolutionary explanation for Eleanor’s outburst. According to the neuroscientist, while most of humanity struggles with an “us vs. them” mentality, which produces things like racism and nationalism, Eleanor might never have moved past “me vs. us." Since The Brainy Bunch became such a huge part of her identity and is now breaking up, she’s no longer sure who she is. This makes her self-reflect, and she says she needs to go apologize to their friends. Find out where the apostrophe in her name came from! Eleanor goes back inside and apologizes to the group. Her kindness inspires them to plan a yearly reunion for The Brainy Bunch, starting in Jason's beloved Jacksonville (apparently, the city is rapidly sinking into the ocean). Elsewhere, Michael’s still trying to set things right. He’s come up with another plan that’ll only injure a few bystanders — “it’s called arson!” — but Janet holds him back. She reminds him that this isn’t his neighborhood, and he can’t wipe everything and start over when things don’t go his way. This gives Michael one final, terrible idea. He decides to re-open the door to the afterlife and reset the Judge’s experiment. There’s just one catch: he has no idea how to do that. But despite Janet’s warnings, he’s determined to try. They open the door to the afterlife and prepare to go through… and all four of the humans show up as the portal opens. “What the hell is that?” Eleanor asks. In her first-ever acting role, the British actress finds interesting ways to make her bad-place-worthy character, Tahani, funny and charming. This season has been pure torture for Michael. First he had to watch his friends failing the experiment, then he attempts to meddle and makes things worse, and finally ends up inadvertently revealing a secret of life-and-death proportions to them. Are we sure Michael isn’t being tortured? Even though Eleanor isn’t perfect, she’s a whole lot better than she was. The old Eleanor Shellstrop wouldn’t have admitted she was wrong, or asked Simone what was wrong with her brain. I think she’s on the path to the Good Place. Jason Mendoza’s love for the Jacksonville Jaguars is the gift that keeps on giving. Chidi didn’t have much to do or say this episode. I hope that changes next week!